Despite the mounting costs of climate change and inevitably declining oil, natural gas and uranium reserves, the vast majority of cities and urban communities is planned and managed as if such existential crises did not exist. Hence the transition from fossil fuel dominated cities to an urban future marked by a radically new, renewable energy infrastructure requires entirely new tools and frames of decision-making. This is an original guide to an entirely unprecedented urban transformation, to cities and towns powered by renewable energy. Squarely focused on action, it supports design, planning and management decisions and serves as a practical guide to practitioners, academics and political leaders in communities and cities worldwide, as a useful and well-structured reference text. It is built on the most successful of past and present urban sustainability trends and emerging infrastructure directions, presenting renewable energy applications as offering new and inevitable approaches to urban infrastructure planning and the design of cities. 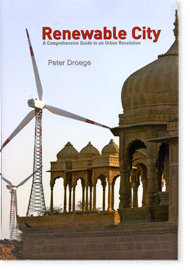 Peter Droege is an expert on the role of renewable energy within the fields of urban design, development and urban infrastructure. He has directed and developed Solar City, a research development effort conducted under the auspices of the International Energy Agency. Droege has performed academic roles at major universities in the United States and Japan, and is presently holding professorial positions at the Universities of Newcastle, Australia and Beijing, China. He is a Chair of the World Council for Renewable Energy, for Asia Pacific, and directs Epolis, a Sydney-based consultancy active in sustainable urban change worldwide. On the cover: India is rapidly emerging as a renewable power giant. Bada Bagh (‘Big Garden’) in Jaisalmer, built by Maharaja Jai Singh II 300 years ago, is a contrast of traditional Rajasthani architecture and modern energy technology. The site is a historic desert oasis and dam enveloped by a vast wind park: ancient and future systems merge.